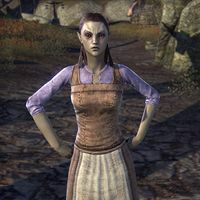 Elynisi Arthalen is a Dunmer citizen of Selfora who initially can be found in the Selfora Inn. She is the one who asks you to help with the unrest in Selfora. Elynisi is the daughter of Tidyn and Orara Arthalen and the sister of Rilen Arthalen. If you approach her once the town is safe, she tries to be optimistic, "Perhaps life will return to normal now." However, she does not succeed, "Normal, what am I saying? Father's dead. Normal doesn't exist anymore." This page was last modified on 2 February 2018, at 00:28.